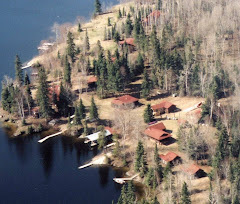 Bow Narrows Camp is a fishing lodge on Red Lake, Ontario, Canada. Anglers fish for northern pike, walleye, lake trout, whitefish and ling or burbot. The camp is 20 miles by boat from the nearest highway. This fishing resort has been in existence since 1948. This is a splendid example of a timber wolf, also known as a grey wolf. This shot came from my oldest trail camera but one which always seems to be in the right place at the right time. It's about 500 meters from our house here in Nolalu. I'm pretty sure that this is the same animal we saw from our front window two or three weeks ago. 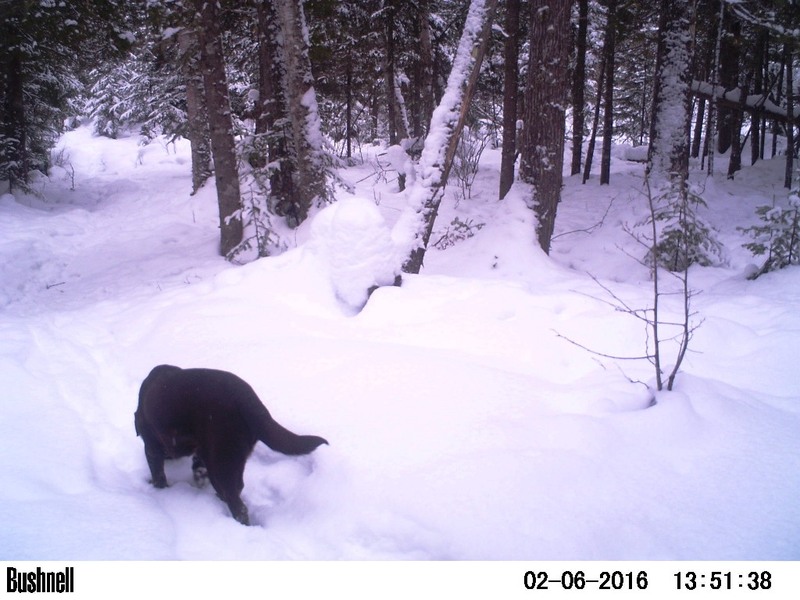 He was trotting through the deep snow fairly easily and seemed destined right for our neighbour's across the road. He got about half way across our field when he changed his mind and came back to our bush. I at first feared that he had intended to go after the neighbour's dogs but on further inspection of tracks in the field I realized he was just following a deer. Nolalu seems to be a wonderful place for wolves. I get photos of them regularly on my trail cameras which are just placed on our own 65 acres. There seem to be many more wolves here than at our camp on Red Lake. 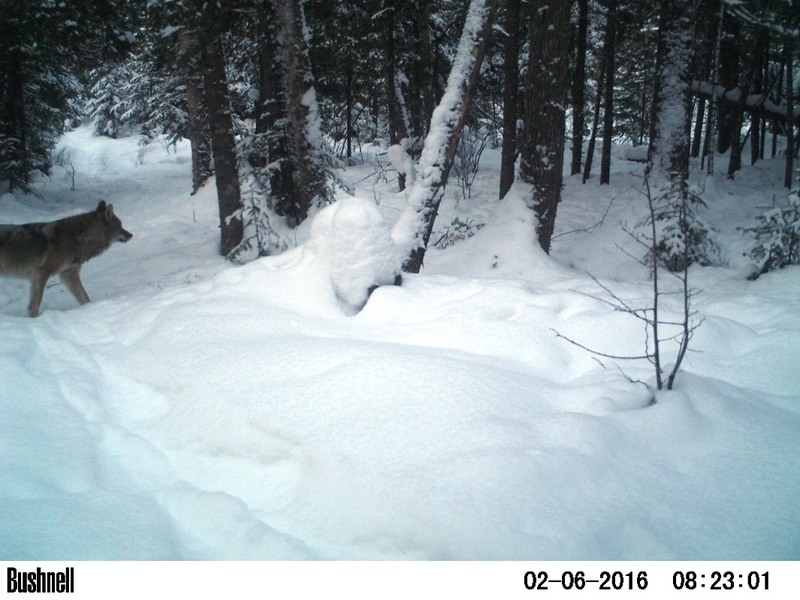 The reason is almost certainly that there is a high population of whitetail deer in Nolalu while Red Lake is still one of the few places with almost nothing but moose. Wolves prey on moose, that's for sure, but the bigger moose are much harder for them to kill. It definitely takes a pack of wolves to bring down a moose and I suspect it is pretty risky business. One clip from a big hoof and a wolf is probably done for. Deer are much easier. 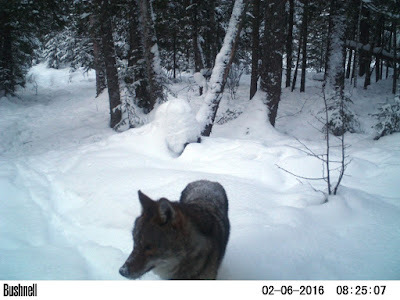 This wolf seems to be hunting by himself and as the photos show, he is not lacking for food. Check out that muscular neck in the first photo in particular. This is a big fellow, twice the size of Cork, our 75-pound chocolate Labrador. Could he weigh 150 pounds? I can't tell but I do know that wolves are always lighter than you would expect, a function of having zero fat on their bodies. The question often arises about safety when around these big canines. I have never personally known anybody who was either attacked or threatened by a wolf. They are almost supernatural in their ability to avoid people. It is true that they can be a threat to dogs. About once a decade, it seems to me, there will be a rash of wolves killing dogs here in Nolalu. Eventually the offending wolves are seen and shot and it always seems to be just two individuals, a male and a female. That probably indicates the dog-killing has something to do with reproductive behaviour, but reproduction occurs every year and not the dog-killing so I don't really know what is going on. Wolves are pretty single-minded. They want ungulates -- deer and/or moose. 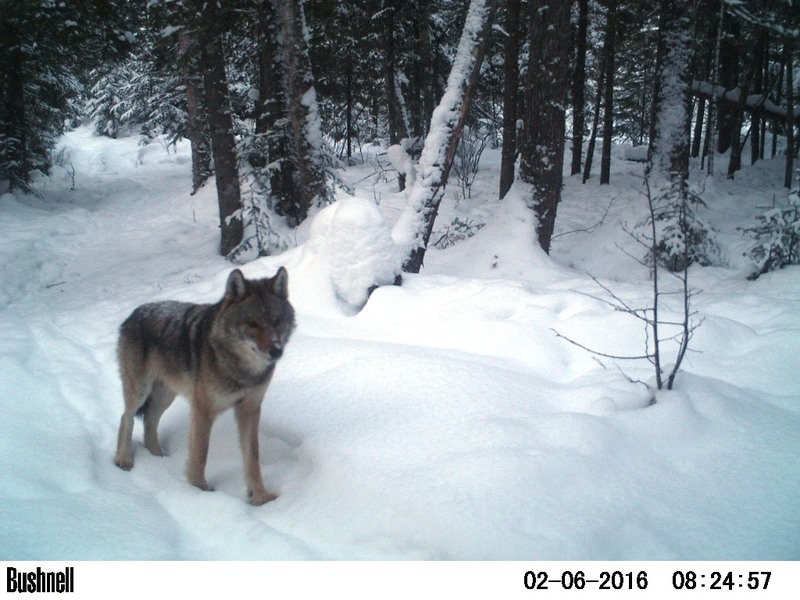 In deer territory there are obviously far more wolves and when deer expand into traditional moose territory the resulting increase in predators means more moose are killed than normal. It's a double whammy for the poor moose. The deer also bring with them a fatal parasite called brainworm that devastates moose populations. Great Shots Dan. Do they show any aggressiveness towards Cork ? He has never encountered one, at least up close. You might think that wolves would smell just like dogs but that doesn't seem to be the case. Cork, like our other dogs in the past, seems fearful of the scent of wolves. He may bark at them from our yard when the wolves are far off but if they are closer, he wants to come into the house. We keep a close eye on him when we let him outside, especially at night. Bait dealers in Northwest Ont. Do You Have Fishing Guides? Test your knowledge of Red Lake, Ont. Does this look really tasty to you? What happens to fish after line breaks? My wife, Brenda, and I retired as owners of Bow Narrows Camp in 2017 but still live in Northwestern Ontario, at our home in Nolalu in the winter and soon at our cabin on Red Lake near the camp. I grew up at this remote fishing/hunting wilderness lodge which was first created in 1948. My mom and dad, Del and Don, bought the camp in 1961. My family then operated the camp until 2017.